The 60 metre motor yacht Elandess, listed for sale by Burgess, has been sold with Glynn Smith at DenisonYacht Sales introducing the buyer. 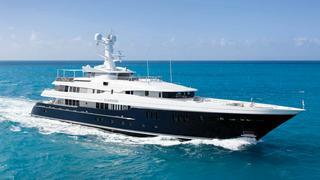 Designed by Donald Starkey, she was built in steel and aluminium by German yard Abeking & Rasmussen to Lloyds class and delivered in 2009, going on to be nominated in several categories at the 2010 ShowBoats Design Awards and World Superyacht Awards. A serene interior by Bannenberg & Rowell accommodates up to 12 guests in six cabins including a main deck master suite featuring an Art Deco theme, floor to ceiling windows and a private deck. Below lie two twin and two double cabins that can be converted into two full beam suites, while there is a multi-functional cabin on the bridge deck with two Pullman berths that could serve as a children’s area or be used as a study. The main deck saloon of this offers a comfortable seating area decorated in a pale cream colour palette with bold splashes of colour and a full cocktail bar. Forward is a formal dining area with a large glass topped table and seating for 12 guests. The sky lounge is generously proportioned and offers informal relaxation before a sophisticated audio/visual system and there is another full sized bar. Al fresco entertaining and dining is available aft on both the main and upper decks while the flybridge has a rectangular Jacuzzi, sun pads and sun loungers, a bar and gym equipment. Twin 2,000hp Caterpillar diesel engines give her a range of 5,000 nautical miles at her cruising speed of 13 knots and she is fitted with Quantum zero speed stabilizers. Elandess was asking €52.5 million.